Over the Christmas period it is always so nice to receive cards from clients who we have seen during the year and to remember our involvement with their pet. One card this year was from the owners of Tiggy, a five year old cat that I operated on back in the summer. Tiggy was in the habit of going out to hunt during the night and one morning when her owners got up she was seen to be very lame on her back right leg. She was examined at our Ivybridge branch and marked instability was found at the bottom of the ankle (tarsus). X-Rays confirmed the presence and the position of this instability and, as Will was away, an operation was booked at Kingsbridge for a few days later. The ankle consists of nine bones on several levels with a complex arrangement of ligaments holding them all together. Trauma can give rise to a variety of abnormal movements in this area depending on which ligaments have been ruptured and whether there are any bone fractures. Tiggy’s X-Rays, coupled with palpation of the joint under anaesthetic, had revealed that there were no bone fractures but she had ruptured the ligaments spanning the upper part of the joint between the ankle and the bones going down to the digits. This resulted in the paw being able to angle downwards excessively. It was unclear how this injury had been caused as a knock from a car would probably have done additional damage. It was considered likely that it was caused by a fall and whilst this may have been from a tree or fence her owner had used some deductive reasoning to establish another possible scenario. The finding of a large dead moth under a window beside an antique birthing chair raised the possibility that she had jumped up and killed the moth fluttering by the window but then fallen down and caught her leg in one of the holes in the chair. Unlike an Agatha Christie story, though, we will never know what really happened. The operation consisted of opening up the joint and stripping the cartilage off all the various bones involved. This was to encourage them to fuse together to permanently stabilise the area. Although the gap at the bottom of the ankle is called a joint it does not contribute to the flexion or extension of the ankle (which occurs at the top of the ankle) and so fusion here has no effect on leg function. Stability during healing was achieved by putting a screw either side of the joint with a wire placed around them and tightened. 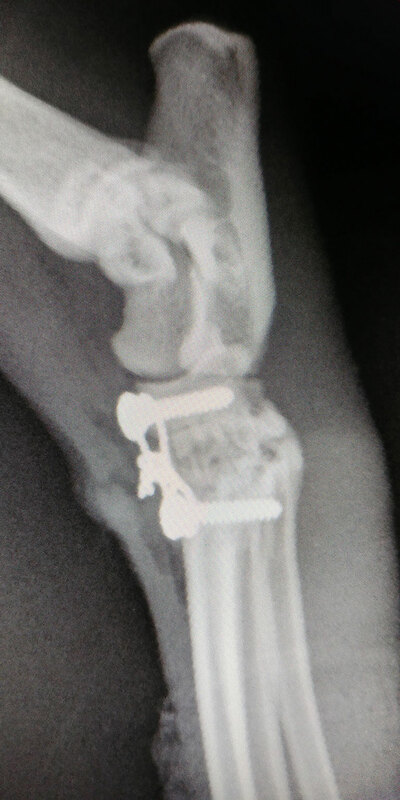 As the owner was keen to minimise Tiggy’s time in a cage the repair was supported with an external splint. 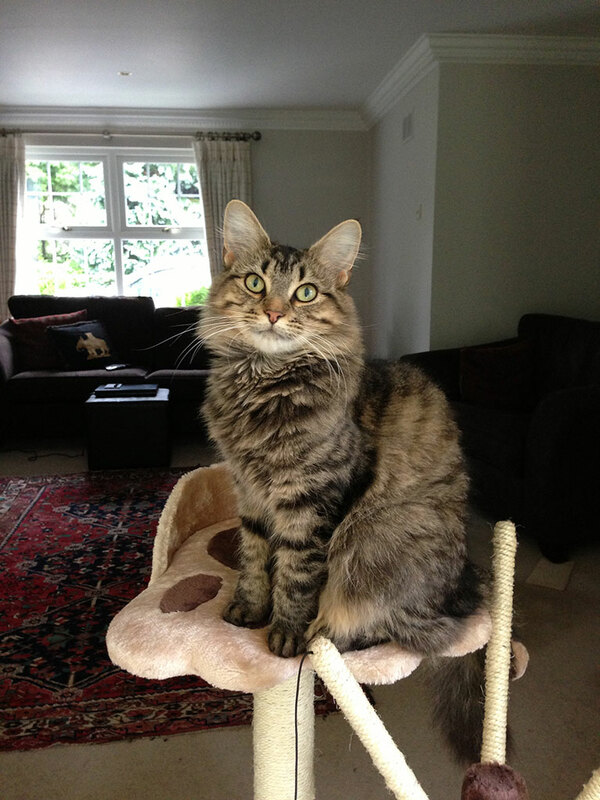 Her owners cleared a room so Tiggy did not have anything to jump up on. They also brought in a mattress and a TV so that they could be with her day and night throughout her recovery. Tiggy was incredibly frustrated at being kept in and would spend hours looking at the birds through the window. For two of the weeks she was apparently very absorbed in watching Wimbledon but after Federer had won his eight title it was back to the bird watching. The TV then provided a distraction again when it was found that she loved watching a meerkat DVD over and over again. Eventually the splint could be removed, the room rest was extended to house rest and then after a couple more weeks she could get back to her normal outdoor life which she is thoroughly enjoying, with no hint of lameness.